What makes sea anemones immortal? They're tiny sea creatures who attach themselves to rocks, and look a bit like colorful sacks topped with delicate tentacles. They're one of the most ancient animals on Earth, and share a common ancestor with humans (along with all other vertebrates). And they're immortal. No, really. 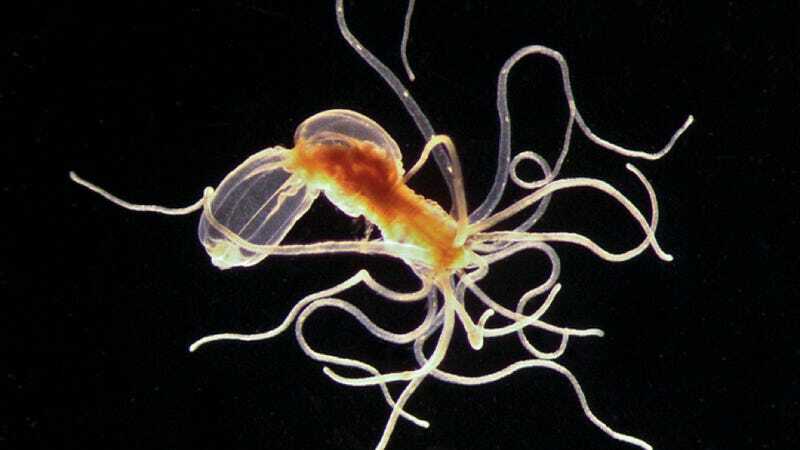 I spoke with genomics researcher Daniel Rokhsar, who worked with a team to sequence the scarlet sea anemone genome in 2007, and continues to study the tiny, tenticular creatures in his lab at UC Berkeley. After he and his colleagues analyzed its genome, they discovered that sea anemones have closer ties to vertebrates than anyone had realized, making them more closely related to humans than they are to flies and worms. Also, according to Rokhsar, one of the things that surprised the researchers was the complexity of the sea anemone nervous system. Though the creatures don't have brains or central nervous systems, they do have genes that create specialized nerve cells. It's unclear why, or what those cells do. He calls it the "cryptic molecular neuroanatomy of the sea anemone." But that's not the only cryptic aspect of sea anemone biology. They live a very long time – one was documented to have lived a hundred years. They don't have old age. They live forever and proliferate, just getting bigger. You'd think that would be weird enough, but there's something even stranger about sea anemones. Despite the fact that they can live for so long, their cells don't seem to mutate the way cells in elderly humans and other animals do. "You should see tumors in these animals, but we have very few descriptions of that," Rokhsar marveled. "They are constantly replenishing themselves without getting cancer." We have no idea why sea anemones are able to live for seemingly unlimited amounts of time without developing tumors. Rokhsar suggests it's possible that they simply slough off their cells so quickly that they never have a chance to mutate. Their skin is only two cell layers thick, so it's as if they shed their skins all the time. Or maybe they have another mechanism for preventing tumor growth. Rokhsar hopes to find out, by studying the sea anemone genome further. Given that humans do share a common ancestor with these creatures, it's possible that studying them might lead to a better understanding of how humans age and mutate. "Obviously it's a lot harder for me to regrow my arm than for a sea anemone to regrow its body," Rokhsar cautions. These are very simple animals, and their brand of immortality may never prove relevant to us. But then again, maybe it will.